Today is a decluttering day. Decluttering makes it easier to keep your home in order as there is less to tidy away on a daily basis. I find decluttering empowering and it’s like a snowball, once you get rolling you will find it hard to stop! I will blog different decluttering ideas over the coming weeks but today’s challenge is focused on getting rid of the stuff that doesn’t require any kind of sorting, it just belongs in the bin. A lot of clutter is actually rubbish. Things that are broken, stuff that is out of date, junk mail, random trinkets and plastic junk. This decluttering challenge is focused on clearing out the worst offenders and it will only take about 10minutes. Pick up a big solid garbage bag. Start at your front door and move through each room of your house, chucking out 10 things from each room. Stuff that is broken, random things that have accumulated, junk you don’t need, be brave, chuck it! Open drawers, dig under beds, if you don’t use it, don’t need it or don’t like it, chuck it! Feel free to go above and beyond 10 items. I know there at drawers in my home where I could easy chuck 20 items in one go! 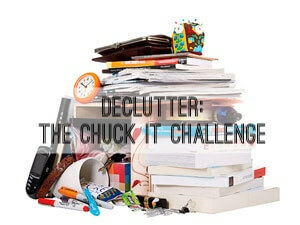 Ready to get serious about clutter? Check out my guide on decluttering your home for good.